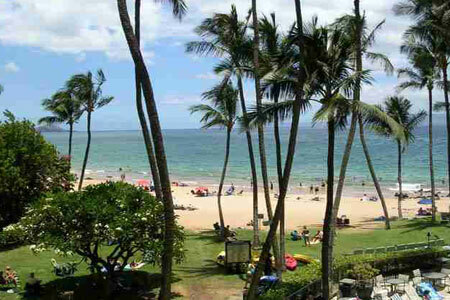 Highly regarded as one of the premier locations in Kihei, Maui. The ocean front properties of the Mana Kai condos are simply unbeatable. Wake up to the tall swaying Royal palms and the melodic sound of the Java Sparrow. Mana Kai Condos place you directly in your own personal tropical luxury real estate paradise. The condominium grounds are delicately laid out with lush tropical plants and shady palm trees. Listen and watch the waves crashing right in front of you as you lounge poolside. Mana Kai conods features one of the only 4 star restaurants, The Five Palms with an ocean front bar and dining area. Other on-site amenities include a solon, activity center with yoga classes, clothing and general store and an on-site concierge. Our condos are beautifully constructed and completely furnished with fully equipped kitchens. The Mana Kai condos are perfectly located in the heart of the south shore and offer you effortless access to all of the islands activities and attractions; World-class golf courses, a marine sanctuary, an ocean center, daily museum tours, surfing, kayaking, fishing, whale watching and diving are all at your fingertips. Walk right out the door onto the beach and go snorkeling with the turtles and the Potter's Anglefish. Whether you choose to spend the day relaxing in the sun, perched under a shady palm tree, or on the adventure of your life, as a Mana Kai tenant your options are truly endless. At the conclusion of your day, relax in the privacy of your own lanai and enjoy the day’s last rays of sun as it slowly dips over the horizon. Making Mana Kai Condos your Kihei living choice puts you in complete control of your dream condo. Our ocean front property ensures that you are able to find whatever it is that will excite and entertain you and your entire family. The Mana Kai luxury Condos are located between the Kihei Surfside Building and the Maui Oceanfront Inn at 2960 S Kihei Rd., Kihei, HI 96753.